I recently took on a challenge to raise money for Diabetes UK by swimming the equivalent of the English Channel (22 miles) in my local pool, over a number of sessions.. The swim has to be completed between Feb 22 and May 22 but I finished on Friday 18th March (just four weeks). There are 3.5 million people diagnosed with diabetes in the UK and an estimated 549,000 people who have the condition, but don’t know it. Diabetes UK is the leading diabetes charity in the UK, caring for and supporting people with this lifelong condition. Alternatively, you can text the code BBMH66 followed by the amount of your donation to 70070. The Ukulele practice sessions are still taking place on Monday afternoons between 2:00 and 4:00. You don't have to be very musical it's really easy to get started, you can even borrow a ukulele if you don't already have one. Why not pop along as a spectator or singer if you don't think you can play. The above times are for general workshop activities and we also have a special instructional session on Wednesday between 7:00 and 9:00pm when we are currently working on various small boxes. Remember, the box is the basis for most furniture which is really just a collection of boxes of various sizes. If you are interested in the Wednesday evening session, there is no need to book, just turn up. The eBay sessions on Wednesday mornings proved quite popular and now they have come to an end we are continuing this computing slot with a period on Family History. Please just turn up and you will be made most welcome. The sessions will run from 9:30 until 11:00am on Wednesday. Please note there will be no session on 6th April. How about a Shed for Women? We have received requests from several women who would like to be involved in workshop sessions and this was discussed at a recent committee meeting. A number of members have told us they would not welcome what they see as an intrusion into their workplace. However, it was still felt a mixed group meeting at a time when the Shed is not otherwise in use could be successful. A decision was therefore made to run a mixed gender trial, subject to sufficient interest. To this end we invite people who would support such a group of mixed gender working together in the workshop, to contact us with your views. 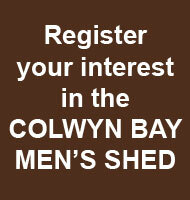 Colwyn Bay Men's Shed will be hosting a variety of events and demonstrations showing people just what we get up to. Please join us and share in the fun and if you are able to help on the day please let us know. All meetings at Pentre Newydd are from 10:00am untill 12:00 noon on Fridays. Directions and a map can be found here. Arrangements are well advanced for our visit to the Airbus factory in Broughton on 25th May. This promises to be a fascinating outing for our members and if you are interested please speak to David Bird who is organising the trip. George is organising an outing to the Vauxhall factory in Ellesmere Port, the home of the Astra. The date has yet to be confirmed but it will be later this year. If you are interested in this trip please speak to George Cassey as soon as possible so your name can be added to the list. With spring now in the air, it is proposed to start the digital photography sessions again as soon as possible, probably on a Thursday morning. With the new equipment and facilities available at Rhiw Road there is every opportunity to learn to improve your skills in this ever popular pastime. If you are interested in attending please contact Alan Foulkes or email me and I will pass your details on. Plus other projects that are in the pipeline. As a group we have been helped enormously by both the Town & County Councils and other local organisations and your committee feel quite strongly that it is time for us to give something back. However, this work cannot and must not be left for the dedicated minority. We need willing volunteers who can help us pay back to a community that has helped us so much. Please speak to any committee member about how you can help. The above times are for general workshop activities and we also have a special instructional session on Wednesday between 7:00 and 9:00pm. Starting this Wednesday evening (10 Feb 2016) Brian will be demonstrating how he makes his bandsaw boxes and those attending will have the opportunity to make their own. This is likely to take a few weeks and will be followed by making some hinged boxes with dovetail joints and again those attending will be able to make their own. A couple of members enjoying a joke at the 2014 Christmas meal. An example of a typical bandsaw box which will be demonstrated on Wed evenings from 7:00 to 9:00. There is some interest in learning the ins and outs of selling items on eBay. We have therefore arranged some training sessions for Wednesday mornings from 9:30 to 11:00 starting a week on Wednesday 17th Feb 2016. All aspects of selling on eBay will be covered including some simple techniques to get the best photos of the things you are selling. Some preparation will help you get the most out of these sessions. As you may well know, the feedback system is very important to eBay and particularly for sellers. To this end, it will help you enormously if you already have some feedback before you start selling. If you don't yet have an eBay account, you will need to open one. It is simple to do, just go to eBay.co.uk and click the 'register' link near the top left of the screen. fill in a few personal details and your account will be set up. You then need to buy a few inexpensive items so you start to get some feedback from the sllers. We can cover this during the training sessions but it will help if you can do it in preparation, the sooner the better. All meetings at Pentre Newydd are from 10:00am untill 12:00 noon. Directions and a map can be foundhere. 12th - Vin Murtagh from Cartrefi Conwy.